Jephtha is Handel’s final oratorio before blindness claimed him. It tells a dramatic story from The Book of Judges. Jephtha vows to Jehovah that if he is victorious in battle he will sacrifice the first creature to come out of his house on his return. Tragically this turns out to be his daughter Iphis. Handel used the story to create one of his greatest works, with full-scale, powerful choruses and moving solo arias including ‘Waft her, Angels, through the skies’. 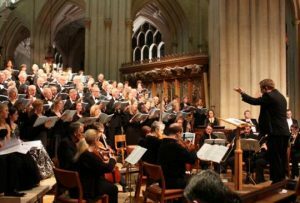 David Gostick conducts Bath Choral Society and Bristol Ensemble in a semi-staged concert performance developed from the recent opera production by Iford Arts. The soloists are Iford principals: tenor Mark Bonney as Jephtha and countertenor Ben Williamson as Hamor; and Iford Arts New Generation Artists: Jessica Leary as Iphis, Lucy McAuley as Storge, and Peter Brooke as Zebul. The performance will be a shortened version lasting approximately two hours.